This Barbie doll cake is a strawberry flavored butter cake. It contains 21/2kg. These are the things which I used to make the Barbie doll cake, and then it bakes under 180'c. I kept it to cool, and then I pipped the cake pink and blue color butter icing. Editor's note: I loved the vibrant colors that you used for this cake. It really makes it bright and cheery. I am sure the girl you made it for loved it as well. 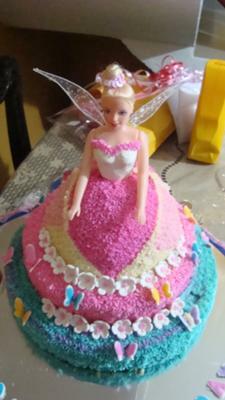 Thanks for sharing your beautiful Barbie doll cake with us!